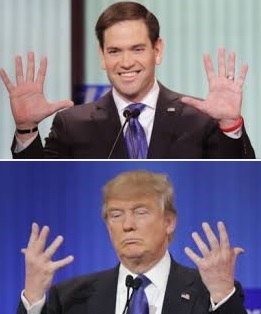 This debate on March 3, 2016 will be remembered for Marco Rubio's argument with Donald Trump about the size of their hands and other body parts. Many viewers considered that argument to signal the end of civil debates, and/or the coming end of the Republican Party. Before this debate and after Super Tuesday on March 1, Gov. Mitt Romney (R-MA) (the 2012 nominee for president and hence the leader of the Republican party), denounced Donald Trump. By "denounced" we mean "anti-endorsed": Romney suggested voting for each of the three remaining candidates in any state where they could beat Trump (especially the winner-take-all states). A "brokered convention" means the nominee is not decided in the primaries, i.e., no candidate secures more than 50% of the delegates. Hence the nominee is decided at the convention, whereas a "normal convention" is more like a coronation of the nominee, with the main excitement being the vice-presidential selection. The most recent brokered conventions were in 1952 for the Democrats and 1948 for the Republicans, but the nominee was not known in advance of the 1968 Democratic convention; the 1976 Republican convention; the 1980 Democratic convention; and the the 1984 Republican convention. Those recent conventions had nominees negotiated after the primaries and before the convention; a true "brokered convention" has the nominee negotiated during the convention itself. A common practice for negotiating the nominee at a brokered convention is that one candidate agrees to accept the vice-presidential nomination, and tells his delegates to support another candidate for president. The mainstream media speculated on a Rubio-Kasich ticket; for that ticket to succeed, the sum of Rubio's and Kasich's delegates would have to exceed 50%. The above quotations are from 2016 Fox News GOP debate in Detroit Michigan.